A change for the better at Eagles Meadow shopping centre | News by Wales Express News, People Before Profit! A shopping centre has earned national recognition for the quality of its facilities for disabled people. The disabled toilets at Eagles Meadow in Wrexham have been accredited by learning disability organisation Mencap and included on a map of their approved locations. People with disabilities such as Cerebral Palsy, Motor Neurone Disease and Multiple Sclerosis, who simply can’t use standard accessible toilets, need facilities they can use to enable them to get out and about. To use the toilet in safety and comfort some disabled people need to be able to access a Changing Places toilet which has more space and the right equipment, including a height adjustable changing bench and a hoist. It’s been a Godsend for retired builder Peter Billington and his wife, Barbara, from Bangor on Dee, whose daughter, Ashley, 29, suffers from Cerebral Palsy and is a wheelchair user. According to Peter, having a Changing Places facility at Eagles Meadow means Ashley’s carers, who take her out once a week, can spend time out without having to panic about getting home so she can go to the loo. He said: “There are very few places that have suitable toilets for disabled people like Ashley. “Ashley has carers who come and take her out once a week giving Barbara and myself some time to ourselves. But they aren’t allowed to lift Ashley without a hoist. That means they are always restricted to how long they can spend away from home. Barbara added: “Ashley loves going out with her carers. She enjoys eating out, although she can’t feed herself. And they take her bowling and do many things ordinary people take for granted. “But, with nowhere to go to the toilet, they are limited as to where and how far they can go and how long they can go out for. Having a hoist is massively important and a changing bench if it’s needed. Sophie Lay, 18, of Johnstown, also has Cerebral Palsy and uses a wheelchair. Her mum, Sharron, said: “It’s an amazing facility and a good size. It means Sophie can come out with her carers without having to panic about how long they are out. It means she has some small level of independence and freedom. 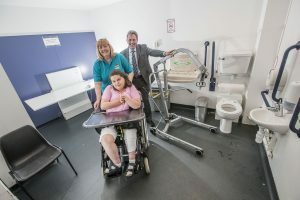 Carol Gardner, the charity manager of Wrexham-based Dynamic which provides activities for young people with special needs including a range of physical disabilities says the Eagles Meadow Changing Places toilet is a vital resource to the charity. She said: “It’s really important. It means when we bring young people to Eagles Meadow whether to go bowling, to a restaurant or just too simply shop we have somewhere where we our young people can go to the toilet safely and with some dignity. “Having a hoist and a changing bench is really important when you are caring for young people and adults but there are so few places that provide adequate facilities. She added: “Sophie attends Dynamic and Ashley used to but now she’s 29 she is too old. It’s a shame but once disabled people such as Ashley get to 25 there is very little provision for them and it’s really left to their parents. Eagles Meadow manager Kevin Critchley wants more people to be aware that the Changing Places facility is available at the shopping centre. He said: “The Changing Places Consortium launched its campaign in 2006 on behalf of the thousands of people who cannot use standard accessible toilets. “This includes people with profound and multiple learning disabilities, motor neurone disease, multiple sclerosis, cerebral palsy, as well as older people. “It’s a facility that is only really important to a relatively few disabled people and those that care for them. But it’s a vital facility that allows a measure of freedom they otherwise might not have. “We have had the Changing Places facility here since the shopping centre opened and I know how important it is to a number of disabled people and their families.